Now that Ian is two, we're beginning to really feel the need for a little more space. It's a buyer's market, but when you've got such a wonderful place to come home to, nothing seems like an improvement. We calculated many scenarios. We dropped our weekend plans to check out neighborhoods and argue the ins and outs of every detail in a series of imagined housing situations. We got into spats about toilets in bathrooms and toilets outside of bathrooms. We drove across vast expanses covering every single road, zigzagging for hours through neighborhoods near and far. We frustrated many real estate agents. In the midst of all of this, I was taking my winter morning walks up Lyon's various long ancient urban stairwells. Looking over the city, I was silently saying my goodbyes while I watched the sun rise over fog softened rooftop silhouettes. Staying in the choice neighborhoods would have to entail a stroke of luck. The lock tumbles, the wood creaks and settles under your feet, the light plays just so. We have allowed ourselves to be pulled into the fold of this family heirloom-like bijou of an apartment, magically placed on a square nestled into the curve of the Saone, river on one side, hill on the other, every day for the last eight years. At first, the 14 foot high ceilings, glistening polished marble fireplaces, the beautiful carved panels and 19th century woodwork didn't seem possible. The soft light, branches of the trees swaying in the breeze, birds singing on the square, too luxurious to be true but somehow happening. We painted the walls grey and kept the wood and marble buffed and polished. Looking for an apartment has been a very invigorating project. The stories I could tell you! Once we had seen everything on the market in the neighborhoods we wanted, it became a mad scramble to get in and see everything the day it was put up for sale. All the best apartments usually got offers the first day they were on the market. One day, between appointments to look, I stopped into a real estate office with the idea of asking a few questions about possibly finding a combination shop front and living space, just an idea for my teaching kitchen. A charming man named M. Bernard, an expert in his field, received me in his office and listened to my dream. His eyes lit up immediately. He had a place in mind. 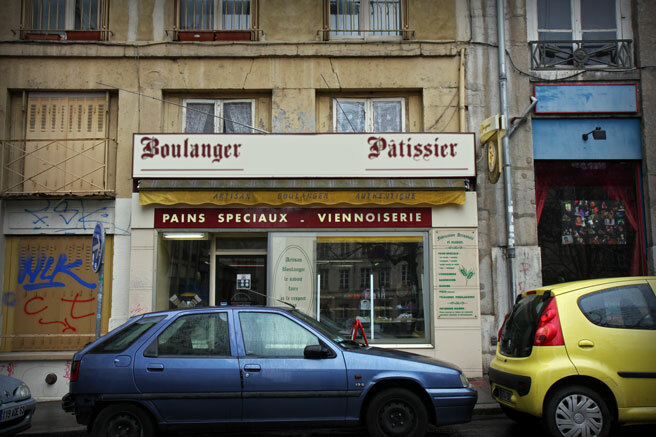 It is an old boulangerie, smack in the middle of the perfect neighborhood. It needs more than a little work, more than a renovation. It needs a complete strip down to the bones and a rebuild. Before he saw it, Loic thought I had gone off the deep end. I told him, in preparation for our first visit together, that this world was created by people who were brave enough to imagine possibilities and make them happen. I reminded him of projects I have handled in the past. With this in mind, we examined the old boulangerie, we held hands, and we dared to fall in love with what was underneath. You know, I have been giving my classes for awhile now. This was initially a series of talks for Dartmouth College students here on exchange in Lyon. When I got started at Emile Henry, the clientele changed but the material remained as dense as it was in the beginning. The context of Lyon as a city and the love of cooking from the market basket help people to remember and learn better, feel like they’re taking home something more than a recipe. I have garnered much encouragement and support from my students, while I give them encouragement to go ahead and build on their repertoire. Just the other day, the owners accepted our offer on the boulangerie. We’re going for it. I am going to build my teaching kitchen. One day you go from "wouldn't that be nice" to "now is the perfect time" And when that happens, if you've been taking yourself seriously and really asking this question in earnest, your dream, the one you have explored over and over again in your mind for years, so much so that it seems like already a done deal in your mind, might actually fit into your life plans. Oh. My. That is very, very exciting indeed! Congratulations. Can't wait to watch it progress. Thank you, Wendy. It is going to be a great project. Considering all you have accomplished thus far, this should be a breeze. Bon chance! Holy moly! That's awesome! How exciting. Maybe someday I'll be able to come take a class. Wow, that is so very exciting!! I love seeing a real dream come true, I'm really happy for you! A dream come true, indeed, and now it's in motion. Is there a possibility of a photographic journey from the "Now" to the magical "THEN"? I truly wish you didn't have to change the signs---they're priceless. Will you keep the board and perhaps hang it inside? What a delighful, life-changing Adventure! Wow, that is exciting! I hope I get the chance to see it one day. Congratulations on all the new ventures. I felt every twist and turn of your looming adventure. Wonderful! All good fortune to the future, for you and the boys. Wow. Are you still in old Lyon? Is that a picture of the place? Where in Lyon is it? More details? What an exciting new project! I hope someday to be able to take a class. Until then, I'm looking forward to following your newest adventure. Congratulations! Thanks! We are staying on les pentes de la Croix Rousse. Just a little bit higher up - a quick jaunt up to the Croix Rousse Market, and actually the same distance from the Metro as we are now. Wow - so exciting. Bravo for taking a risk! Renovations are in order too I imagine :) - new oven, pastry prep area, and so on! That sounds like a marvelous project, Lucy, and surely there are very good vibes remaining in this space from the former boulangerie activity. I enjoy nothing more than a before-and-after, so I look forward to seeing whatever you want to share with us as you make progress with the rebuild. How exciting! Best of luck with the purchase and the refurb work! Merci Corinne! Mais bien sur. Thanks Erica, lots of renovations, that's for sure. Thank you Clotilde. THe place is simply humming with good vibes. I just hope the neighborhood will forgive me for not keeping the place a boulangerie. Brava! You are so brave, so crazy. So wonderful to follow your dream. Remember this moment, the intoxicating infatuation with your plans...when you are knee deep in dust, wondering what on earth possessed you... remember the dream and you'll get there. Good advice, Judith. We were at the architect's today and finished up the meeting. She said something like, you must be so full of emotion right now! And I thought for a second. When we bought our first apartment, yes, emotions ran high. But now, more like a feeling of readiness, like I've just embarked on a mission. Really calm, really ready to express my love in this project. Do you know what I mean? Congratulations! This is so exciting. I look forward to your description of the rebuild, although I so love the way you describe your current home. Congratulations! That is so very exciting. I can't wait to hear that you're up and running, so that I can come down to Lyon and pay you a visit! Very exciting Lucy!! One more reason to stop by Lyon next time I am your way! Sorry , I seem o be very late with my congratulations . But they're heartfelt , none the less . The whole idea sounds very exciting ! Lucy, I hope you'll forgive the late congratulations - I've been behind in my blog reading and so disappointed I missed this! Listening to that voice that says "Now is the time" can be such a challenge, and it's so life-affirming and inspiring to read that you heard that voice and acted on it. I wish you the best of luck and my sincerest congratulations! Thank you very much for your wonderful comments, friends. I hope you will take photos of your old apartment -- I love the fireplace photo and I would also just LOVE to see the bathroom, the kitchen, the closets, the view out the window, all those little spots that will probably be so different than what I am used to here in California. Part of my huge pleasure in your site is trying to image all these details of life in the real France. Thank you! Congratulations with the new. Of course I'd love to see every stage of that, too. I'm obsessive about before and after photos -- esp when the before is from another era.